The support categories in New Zealand offer up a mixture of names and categories we know well back home and some we've never seen or heard of before - and I love that. Five categories will pound around Pukekohe before our V8 Supercars, including their premier Touring Car category, two different Ute classes, a one-make Toyota 86 series and some old school muscle cars. I didn't realise it growing up but the Spice Girls hit "Two Become One" is actually a song about New Zealand's two premier categories, the V8 SuperTourers and NZV8. Thankfully they were able to "be a little bit wiser" and merge the two series, leading to a fantastic result. The opening round of the new championship saw Jason Bargwanna (reigning NZV8 champ) get the win over Simon Evans (reigning SuperTourer champ) with other talented drivers like Craig Baird in the mix too. CMC is the bro category to our Touring Car Masters and is well worth a watch because big, brooding 'hero cars' are made for fast, wide-open tracks like Pukekohe. There should be a healthy grid of over 30 cars with plenty of US muscle and Aussie built beauties. The first of two Ute categories racing this weekend is one we know well, as it is the Kiwi-equivalent to what we see at home. Sam Barry - who has raced in our series in Australia leads the championship with two rounds to go but there will be a huge wildcard in the mix this weekend in the form of Queenslander, Kris Walton. He's the reigning Australian and NZ Ute champ and I'll be very surprised if he doesn't clean sweep the weekend. I love a good one-make series as the racing is usually very close and you always know the victorious driver really earned the win. The Toyota 86 is a cool little car that handles like a go-kart and should teach young drivers good habits, which explains why half of the field is under the age of 21. We have our own Toyota 86 series starting up in Australia next year, so this is a good chance to see what we can expect. I don't know whose idea it was to start a one-make series for large Korean SUV vehicles but I want to buy them a beer and hear what other crazy ideas they've got. I've got to be honest, this commentator doesn't know a lot about this series but from what I've seen on YouTube it looks entertaining. They run Mercedes engines, look incredibly top heavy and are bound to swap cheap Korean parts around this fast and bumpy track. I bet you don't change the channel. 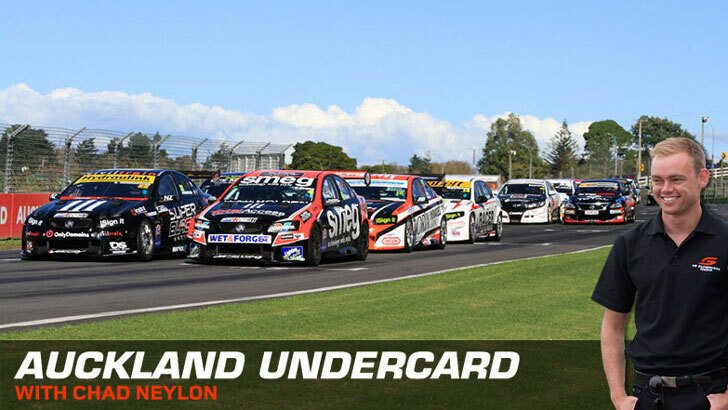 - BNT NZ Touring Cars: Keep an eye out for Dunlop Series regular Bryce Fullwood. His experience on Dunlop tyres saw him run at the front during the season opener. - Toyota 86: At 16, Jacob Smith is the youngest driver in the field. Compare that to NZ racing stalwart, Kenny Smith at the intrepid age of 74. - SsangYong: Rolling starts should lead to an Actyon-packed first corner. - Ladies: It's been a big week for women in sport and the SsangYong series entry list contains no fewer than five female racers. You go girls. You can catch the support category action this weekend LIVE on Fox Sports 506.